Closing candidates isn’t about getting someone to accept a job so you can fill a requisition or generate a commission. It is about reminding them why they are interested in leaving their current position and what they are looking for in their next one. Closing a candidate starts from the initial conversation, which is normally an interview. During that meeting, there are two components that you need to ascertain from the candidate: their pushes and pulls. Pushes are the reasons they are leaving their current position. It could be money, commute, lack of upward mobility or challenge, or many other things. Pulls are what they are looking for in their next role or with their next employer. They are usually tied directly to the pushes, but there can be additional things they are seeking that are not necessarily the reason they are interested to leave. For example, a candidate could be interested in leaving because they are no longer challenged and their opportunities for advancement are limited. These would be their pushes. They would be looking for a challenging new role in a company with upward mobility. These would be their pulls. But they may have additional pulls, such as better benefits or a more diversity-minded company. These aren’t the reasons they are unhappy at their current job, but things they would hope to get at their next employer. 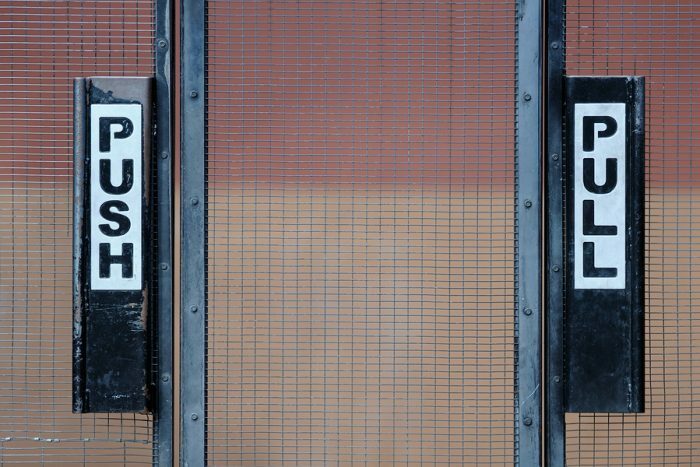 So how do you use pushes and pulls to close a candidate? Almost everyone has heard the phrase “Always be closing.” In all of your discussions with the candidate subsequent to your interview, highlight the pulls the new opportunity offers. This helps them perceive it as desirable and in line with their immediate goals. If you continue to touch on the pulls, the candidate will hopefully not have any hesitation to accept when you extend the offer. However, if they do hesitate or even decline, reiterate the pushes and pulls to them and point out how this new opportunity meets all of the predetermine criteria. Pushes are most useful when a candidate receives a counteroffer. Most of the time, the counteroffer is an increase in salary. If one of the candidate’s pushes were money or low salary, you are on an uphill battle since the reason they were leaving has been rectified. However, if they were looking for advancement, a challenging position, or shorter commute, you have a fighting chance. You can simply point out to the candidate that the salary increase is just a Band-Aid. It doesn’t solve their problem. They will still need to take the long commute to the job that they are no longer challenged by and don’t have the potential to advance in. This also leads to the conversation about how their employer didn’t value them until they backed them up against the wall. Invest the time to get a solid understanding of all of the reason a candidate is interested in leave their current role and all of the things they are looking for in the new one. These may be the difference between an acceptance or starting back a square one with your search. This article represents the views of the author only, and the information contained herein is of a general nature and is not intended to address the circumstances of any particular individual or entity.